Happy New Year! 2015 has slipped into our lives. I find I am responding in typical New Years fashion, reassessing some things in my life, setting new priorities and taking action. My New Year’s celebration here in Vienna was a great introduction to some of the traditions here in Austria. Austria brings an element of sophistication and elegance to the New Year. It was a cold New Years eve in Vienna, but still we spent a bit of time in the center of town, the heart of the celebration. We were surrounded by booths selling spiced wine and Austria’s favorite symbols of good luck for the New Year, including the mushroom and the pig. I was enchanted by the stage teaching people to waltz, watching the pairs glide around the dance floor bundled up in the cold winter air. Back at the home front we shared a good meal and partook in the New Year’s tradition called Bleigießen, or pouring lead. It’s quite simple. Each person gets a lead trinket shaped maybe like a bell or a heart, almost like a monopoly piece. This is put in a spoon, held over a candle and melted. When it is completely melted, you dump it into cold water and watch what happens. 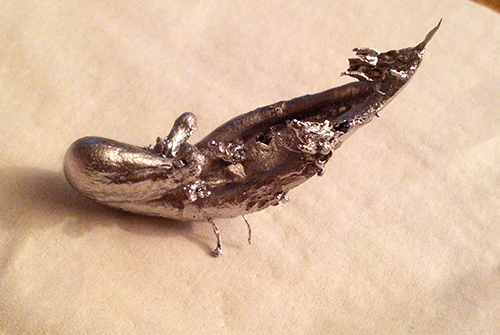 The melted lead instantly hardens into a new shape. Here is the trick… you next look at the shape and see what it looks like to you and whatever it is, is your message for the new year. As we were playing, we checked out websites to learn the meanings of the many different shapes and symbols. Here are mine. What do you think they look like? At midnight my Austrian hosts were sure to dance the traditional waltz at midnight. The Pummerin bell at St. Stephens Cathedral rang. It only rings only once annually, at midnight to bring in the New Year. Neighbors were shooting off fireworks. And it was the New Year! I have been ringing in the New Year with a few changes here. You may notice that I have a new URL and with it a slightly new title for my blog – www.GypsyWomanCafe.com. With this change has come some blog updates, a little redecorating and rearranging the furniture. Here are a few of the highlights! With the introduction of Gypsy Woman Cafe comes a refined and expanded list of blog topics. Included are the familiar Travel Stories and Travel Tips. I am introducing a new topic called A Sip of Wisdom, where I will continue to share experiences and stories related to some of my favorite topics including spirituality, health and well-being. The Blog Topics menu can be easily accessed on the right sidebar of my blog. If you’d like to learn more, please visit my new START PAGE to get the full details. I have expanded my menu to include a more detailed presentation of the services I offer, Graphic Design and Reiki. With my combined thirty years of experience in Graphic Design and Reiki, I am grateful to offer these services no matter where I am in the world. Please let me know if I can be of service! I have updated my Facebook Fan Page to reflect my new title and URL with new graphics as well. Visit facebook.com/gyspywomancafe to take a look! And if you haven’t already, I’d love it if you’d “like” my page! And so my changes for 2015 have begun. I look forward to keeping my momentum with a few new changes in other areas of my world. Top of my list of “new beginnings” for 2015 is to FINALLY find a yoga class I like and attend regularly during my time here. How about you? Any new changes for 2015? Let me know! It’s always good to hear from you!